Norman now boasts the state’s only CBD cafe on Campus Corner. 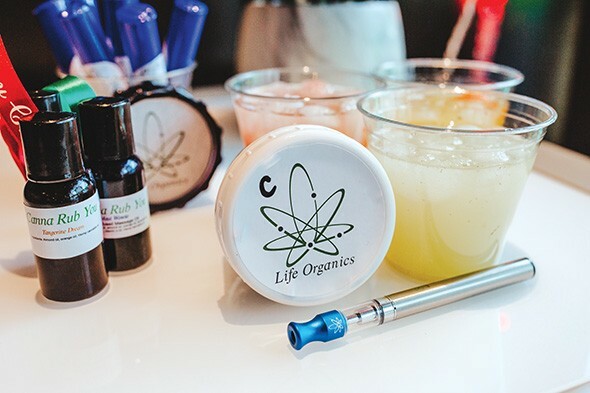 Life Organics Cannafe in Norman offers flavorful ways to take CBD. University of Oklahoma’s Campus Corner in Norman just got a lot more chill thanks to the new kid on the block. Life Organics Cannafé, 588 Buchanan Ave., opened its doors in late October. The quiet cafe boasts of being the only CBD-infused cafe in the state, co-owner Jim Castor said. “When we came in, it looked exactly like The Grasshopper in Amsterdam. We were like, ‘This would be an awesome cafe,’” Castor said. “On-site consumption, everybody’s tried that all over the country, even in Vegas and LA. 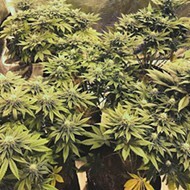 They just can’t get it done because of the THC, the on-site consumption. We were like, ‘The CBD consumption would be great.’ We started out on game days doing an infused slushie. The Grasshopper is a legendary “coffee shop” that stopped serving cannabis in 2014 due to rezoning laws. “We just came up with some great flavors for the drinks, and said, ‘Man, you know, our extracted oils could go in coffees and lattes and got some snacks going,’” he said. “So we kind of go with a microdosing philosophy rather than it being really intense. We have several different kinds of cookies and brownies, and then we have an ice cream sandwich and ice cream with infused caramel or chocolate sauce on there. Those are kind of the dessert items. And then we have a pasta salad that we infuse the oil, a hemp butter and jelly sandwich that’s like the best peanut butter and jelly sandwich you’ve ever had. It’s got pumpkin seeds that are ground up. Everything is made from scratch as well. Our manager’s task is to craft a few new items on the actual food side, so we have a salad right now, we have an avocado toast. Originally from Wichita, Kansas, Castor has started several businesses and his area of study is criminology. His first master’s degree thesis was on the detection of cannabis by devices such as breathalyzers. He and partner Joel Jacobs attended the same high school. There will be no on-site consumption of THC at the Cannafé. That still leaves a plethora of products like CBD pre-rolls and vapeable product, not to get you high, but to calm you down. And more products will be available from Life Organics as research and development continues. 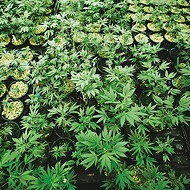 Castor said that eating and drinking cannabis and its byproducts are the most efficient way of consumption. Brightly lit during the day and awash in low green light at night, Cannaf é is also hosting live music. There is often live music on weekends, and midweek music on Wednesday nights. The shows start at 7 p.m. and are free. Lindsey Cox, Kate Carmichael, Cedar Micaelah and others will be performing in January. “It is a totally chill place to come and hang out for the students and for the town. We love it,” Castor said.